I've talked about roasting before. It is my go-to method of cooking any vegetable that cannot simply be sliced raw and tossed into a salad. Half an hour in a hot oven does wonders for even the most despited veggies. It gets rid of the water-logged texture you get with boiling and allows the natural sugars of the vegetables to brown and caramelize, giving them a delicious sweet-savory, nutty taste. Beets are great when roasted. In fact, a roasted beet salad with goat cheese is a staple on bistro menus. I found some golden beets at the market the other day and thought I'd do a twist on the bistro classic by introducing some Mediterranean flavors like lemon, toasted pistachios and mint. The stain left in my baking pan by the roasted beets. Isn't it pretty? Golden beets taste exactly like the more common red beets, but unlike the latter, they won't stain your hands and clothing. Red beet juice is a powerful (very powerful!) dye so use gloves when cutting red beets and don't let wooden cutting boards or utensils come into contact with them. 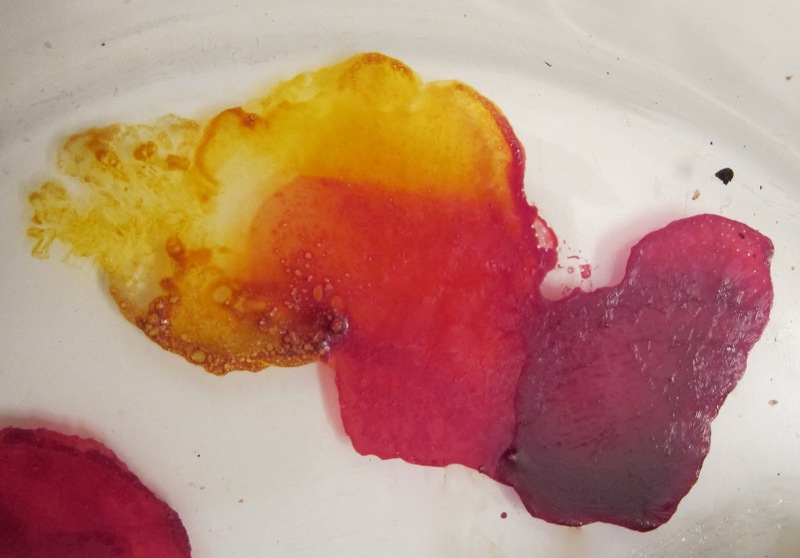 Using one red and one golden beet makes for a very pretty presentation but the taste will remain the same even if you use just gold or just red beets. Assemble the salad just before serving or the red beets will dye the golden ones. You can roast the beets ahead of time and refrigerate them in an airtight container, which allows you to serve this salad at a moment's notice. Unpeeled, the cooked beets will keep in the fridge for 4-5 days. I like my salad dressing to be very zingy, which is why I use a 1:1 ratio of oil to lemon juice rather than the more common 2:1 or 3:1. Adjust the dressing to your taste if you find this too sharp. You can boil the beets until they can be easily pierced by a knife if you don't want to turn on your oven. Serves 4 as a light appetizer or side dish. 1. Drizzle the beets with a little olive oil, wrap them tightly in foil and put the foil package inside a baking dish. Roast in a 400F (200C) oven for 40-50 minutes, until a sharp knife goes easily through the beets (no need to open the package when checking), then cool. 2. While the beets are cooling, toast the pistachios in a dry pan over medium heat until slightly browned, 5-6 minutes, then cool and coarsely chop them. Stack the mint leaves and cut into thin strips with scissors. Grate the zest of the lemon, then squeeze one tablespoon of lemon juice. 3. Mix the minced shallot with the lemon juice and a little salt. Let rest for a few minutes. This takes away the bite of the shallot. Mix in the honey and mustard, then drizzle in the olive oil while whisking with a fork. 4. Wearing gloves, peel and slice the beets into 1/4 inch thick slices. Lay the slices in an overlapping manner on a plate. Drizzle the dressing all over the beets, grind some black pepper over the top, then sprinkle with the pistachios, mint and lemon. Mound the cheese in the middle of the plate and serve.